Funny Pages #34 (Vol. 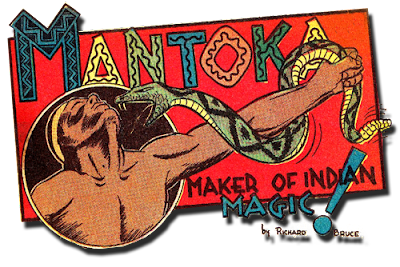 4 #1) Jan 1940 - Mantoka Maker of Indian Magic! 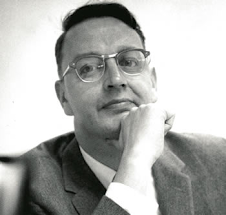 Early in his career, Jack Cole did a lot of work for a company loosely known as Centaur. In 1940, he wrote and drew two stories under the pen name "Richard Bruce," featuring an all-powerful Indian shaman called MANTOKA. The first of the two stories, from Funny Pages #34 (January 1940) is presented here. The second story appeared three issues later, in Funny Pages #37 (April 1940). If anyone out there has scans of this story, please send and we'll post them on this blog! The current issue of Roy Thomas' excellent comics fanzine, Alter Ego (#85, May 2009) features the first part of a detailed study of Centaur comics, including some great reproductions and information about Jack Cole and his contemporaries. I reccomend it. You can order it here. 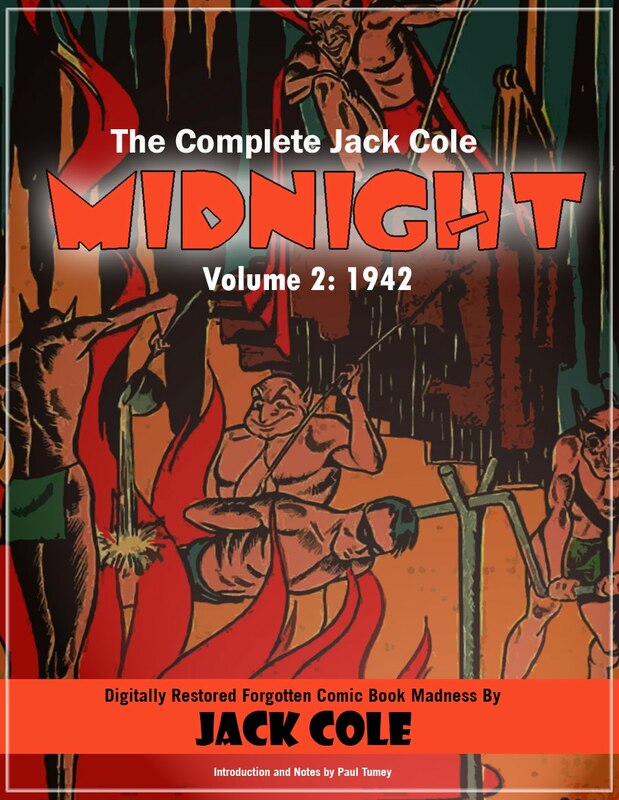 See also issue 25, which is dedicated to Jack Cole (and fandom giant Jerry Bails).The author of the Centaur survey, Lee Boyette, called Cole's MANTOKA series "crude, but engaging." I agree. The art and story feel hastily composed. However, there are some nice touches, such as the dynamically laid-out title box, with the fun lettering. One can imagine Jack Cole sitting down to create this story from scratch, and revving himself up with this amazingly lively title splash. The strong horizontal image of Mantoka holding the snake of knowledge is wonderfully set off by the tilted red rectangle behind him. The snake's rattle shakes just outside the framing rectangle, emphasizing it's power. The text dovetails perfectly into this layout, with the title of the exclamation point perfectly directing the eye down to the next panel below. Nice job, Jack! Also of interest is page 4, panel 5... in which Manatoka pre-figures Plastic Man by zooming headfirst out of a cave. All the slap-dash aside, we in are Cole territory. Manatoka gets his powers from a bite of the "snake of knowledge." He turns evil men into rats, and in the story's end, opens the earth into a vast canyon to swallow up yet more evilness. This is one guy you don't mess around with! Welcome! 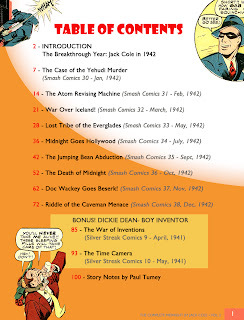 If you’re here, I’m gonna assume you already know the basics about Jack Cole, creator of Plastic Man. If you don’t, then hop over to amazon and order Jack Cole and Plastic Man: Forms Stretched to Their Limits, by Art Spiegelman and Chip Kidd. This is the single best source of information and analysis of Cole’s work. Also, I'd like to thank my buddy, the comic book writer, artist, and scholar Frank Young, for his support and encouragement on this blog. I was inspired by his great blog dedicated to the work of comic book giant John Stanley called Stanley Stories. 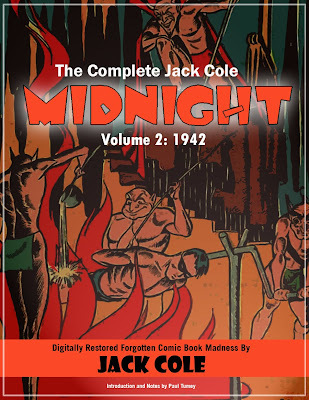 It seems appropriate to begin with some of Cole’s earliest work in comics, and one of his most unique and powerful themes. 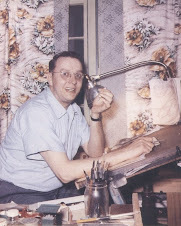 Before he landed at Quality Comics, where he published most of his comic book work, Cole worked for Centaur, Novelty, Lev Gleason, Hilman and Archie (MLJ). Future entries of this blog will share and consider much of Cole’s “early period” pre-Plastic Man work. 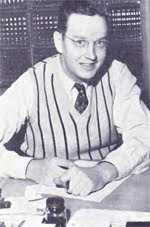 Cole was one of the principal architects of the language of comic book art. He also was perhaps its greatest innovator. A creative dynamo, Cole invented dozens of techniques in comics, both as an artist and as a writer. Sometimes, these inventions were used only once or twice and forgotten about. 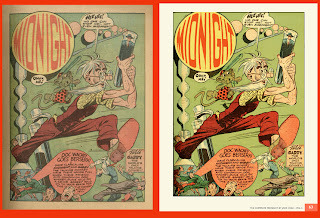 Other times, he would return to an invention over and over, refining and polishing it throughout the course of his 19-year career in comics from 1936 to 1955. One such invention is the image of a character re-arranging his face. Typically, superheroes disguised their identities with masks, hoods, helmets, and eyeglasses (in the case of Superman). Cole pulled this key part of superhero comics inside out, and had many of his heroes actually re-arrange their facial features with their own hands! Instant plastic surgery! Not only that, but his heroes changed identities not to protect themselves, but to outfox the crooks. About a year before he created Plastic man, Cole used this device in a fascinating 3-page story that appeared in Blue Ribbon Comics #1 (November 1939, M.L.J.). 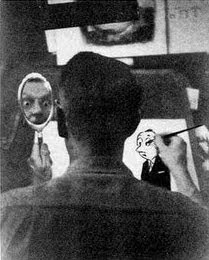 This could be the first example of the face-changing theme in Cole’s work, but not having seen all the early material of Cole, I cannot be sure. In some ways, this story is a blueprint for the Plastic Man stories to come. It moves at an insanely fast pace, it’s crammed with gags, and the heroine appears to enjoy traveling in eccentric (and therefore highly entertaining) means. Most significantly, even though our hero(ine) is wacky, the world around her has gone completely insane… which was the modus operandi of the Plastic Man stories. What’s striking is that, almost from the very inception of the super hero, Cole understood the heroes were every bit as nutty as the villains. Oh yeah… and check out page 2, panel 2. Our heroine changes her face and identify in a very familiar way. Here's the story, interestingly printed in one and two colors. (Click on the image to make it larger. You can also right-click and choose to save the art to your computer). In contrast to the IMA SLOOTH story above, next we have a completely serious, although far from sober presentation of the idea. The face-changing idea must have really appealed to Cole. In the story below, he makes it the central theme and power of a new crime-fighting hero, THE DEFENDER. Meet Bob Larson, a hero who, like Eel O’Brian , was mutilated. Larson created a mask that not only hides his horribly disfigured face (which we never see) but more importantly gives him “the ability to change his facial appearance at will.” The story appeared in in Rocket Comics #2, November 1940 (Hilman). The title lasted only 3 issues, and as far as is known, Cole’s Defender only appeared once, in the second issue. Too bad, since this is truly a whacked-out creation. In this story alone, we get a hero with a magic mask who also owns his own plane and can hypnotize criminals. The crooks have possession of an invisible plane (pre Wonder Woman) and the panels of them flying through the cloudy skies sitting down are in themselves vastly amusing to anyone who has absorbed the thousands of images of superheroes gracefully flying in the pose of an Olympic diver. (Cole re-used this device in Plastic Man #1, with Woozy Winks driving an invisible jeep). At the climax of the story, on page 6, panel 5, Cole draws yet again that haunting image of a hero re-arranging his facial features with their hands. Then, the hero murders the crooks. To say anymore would spoil this amazing, insane story. Except to say that his layout and drawing in this extremely obscure piece are heavenly. Look at this splash. Or the use of slender vertical and horizontal panels... wow! Now, Alex Toth has written (in Alter Ego #25) that he heard Cole wrote his stories as he pencilled them, and did not work from scripts. Note the more crammed and wordy last two pages of this story. Having created many comics myself using the write-as-you-draw method, I can attest to the fact that sometimes you end up with some very dense pages at the end, as you wrap up the loose ends of the story. This story would tend to lend validity to the idea that Cole wrote as he drew, and that he got much better at pacing as time went on. In any case, there are many strokes of brilliance here, such as the last panel on page 2, with a view of a man running to escape a falling building, shot from directly under the man's body! This type of "camera angle" was quite inventive for this period in comics. Heck, it's cool even by today's standards, I think! Here, then, is Jack Cole’s 39th (or so) published comic book story. Enjoy!